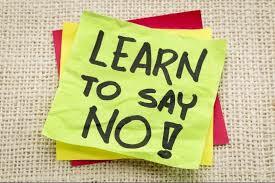 When I work with my clients around this issue, I often find that they do not feel like they have the right to say no. The solution of course is to give yourself permission to say no. You can start this process by choosing to see your time as precious. We can obtain more of most things, but our time is finite. Baring some technological breakthrough, we only have a hundred years or so—and no amount of money, power or fame can change that. If it helps, think of your time as money and convert the time involved in the request into the amount of money could make in the same amount of time. Then imagine giving away that amount of money to the other person. If they are that important you then consider their request, otherwise you should probably say no. Next, recognize that what you want is just as important as what the other person wants and that you deserve what you want just as much as they do. Also, notice that you are just saying no, not killing or harming them in some terrible way. Once you completely accept that you have every right to say no, start using the following techniques to say no skillfully. Ignoring the request is both appropriate and preferable in situations were there is no ongoing relationships, like with telemarketers or an unsolicited request for a first date online. Since some people take any response, even negative, as permission to continue to contact you. Ignoring them is the best approach. However, once you start ignoring someone, don’t be tempted to respond to repeat requests; a reasonable person would recognize that you are not interested. Instead, just block their phone number, email or profile. In our efforts to be kind and compassionate, we often soften the message to the point that it is no longer clear. Instead, respect the other person enough to be clear. Wouldn’t you prefer someone to just be straight up with you and not dance around the bush so much that you are not sure what they meant? Treat them how you would want to be treated. I think you will see that being clear is kinder in the end. We often feel like we have to give a lengthy explanation or justification when we say no. Resist the temptation; giving an explanation is often seen as the opening of a negotiation and encourages the other person to keep trying to persuade you. Even if they ask why, resist the temptation. If they still ask why, shrug your shoulders and say that is just the way you feel. Also, avoid saying you are too tired or too busy to do something, unless you actually want the other person to keep inviting you. 4. Never change your answer. The only reason we should ever change a ‘no’ to a ‘yes,’ is if the other person provides new and relevant information you did not consider while making your decision. Otherwise, if you change your answer, you are just teaching people—and more importantly yourself—that you do not mean what you say and that they should keep trying to persuade you. To help you stick to your guns, recognize that anything anyone says after you have made your decision that is not new information is actually an attempt to manipulate you and deserves a stern warning about respecting your decision. The last part that can trip you up, even when you are clear on your right to say no and do so with skill, is coping with the aftermath. We often have a hard time tolerating sadness in others, especially if they cry, but they have the right to be sad and to grieve just as much as you have the right to say no. So respect their process by giving them time to grieve and don’t try to make them feel better right away. If your ‘no’ involved something more substantial, like ending a relationship, it is not possible for you to comfort them. Attempts to comfort in such situations are often misperceived as changing your mind or as signs of hope for the relationship. Let someone else, like a friend or family member who can be completely sympathetic, comfort and support them instead. Finally, if you have concerns about someone’s emotional stability and you suspect they may take being told no badly, have the discussion in a busy public place where you can safely share your decision. If they do become distressed, you can call one of their friends or family members to come meet them. Of course, if the person is prone to violence, a phone call or message while you are in a safe place may be necessary.